So fellow travelers, it is sunny and 53° (F) outside today. 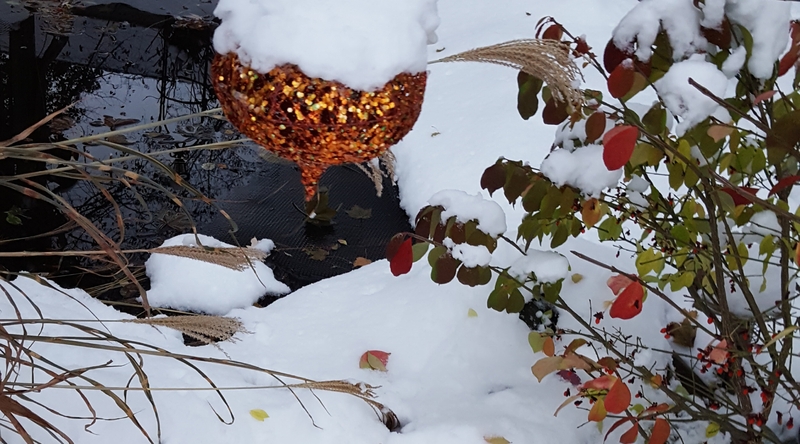 About two weeks ago when a deep plunge in temperatures brought an early round of Lake Effect snow, the garden around the edge of my pond took on an early air of Christmas decor. Today, I spent most of the day clearing out the remnants of the prolonged garden season and tending to a little bonfire in the backyard fire pit where I was burning off the piles of yard debris and many branches which had come down during recent windy days. All around me, little birds chattered at a few lingering blue jays demanding their turn at the feeders I filled just this morning. Every now and then the nasal “hwonk hwonk” of our resident nuthatch could be heard as it dug into the fresh suet I’d also put out. As temperatures have begun to dip down to freezing most nights, I’m mindful of keeping the feeders stocked with sunflower seeds and suet to provide good energy to help my feathered tenants and visitors refuel after the long cold nights. Days end so quickly now, as the Solstice approaches, that I am often caught off guard when shades of pink, gold and purple begin to tint the drifting clouds overhead. Today, when I caught the firstglimpse of color I jumped in my Rav and dashed down the road to a field where I knew I would catch a clear view of the setting sun . I was rewarded with this image. 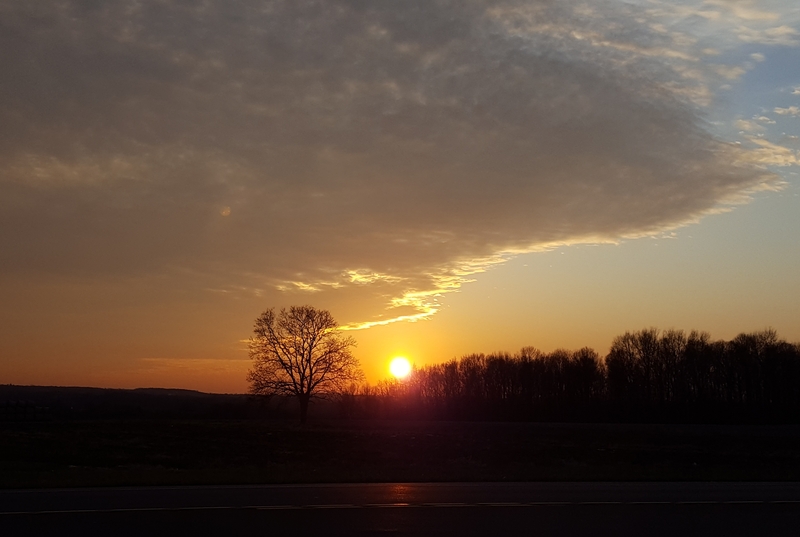 After getting a few photos, I sat in my car and watched the sun sink below the treeline, painting a thin red orange line of light along the horizon. For the first time in several days I felt completely in the moment and totally at peace. I’ve reached that point of the work year where I am feeling the full impact from the loss of the daily writing time my summer break allows me to follow. I’ve been struggling with a few different pieces of writing for a few weeks, pushing myself to finish something I felt was post worthy, but whatever I was trying to say was encumbered by undefined purpose and heavy emotions. As I drove home with the zen of this moment still wrapped around me like a forgiving hug, I gave myself permission to simply sit down and write about this and leave the other pieces be. In time they will either coalesce or not. Meanwhile, I will be more mindful of being present in the simple moments of joy, reminding myself they matter more than the “shoulds” on the “get done” list I might impose on myself. Which reminds me the last full moon of the year is about to rise. I’ve got some more joy to fit in before this day is done. I try to keep the perfectionist me away from my blog – otherwise nothing would be posted. I suspect that is why I have not published any of the poetry my mother is hoping to see in print. 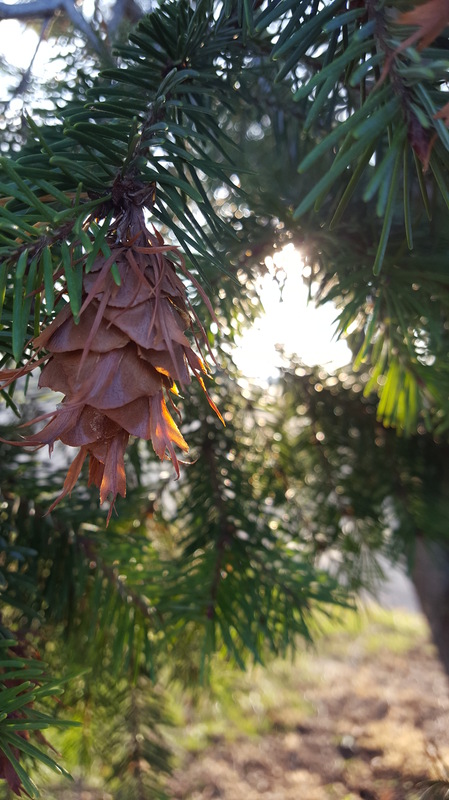 When I sit down to re-read it I second guess everything and so slip into a state of inertia… Writing my blog forces me into a state of being present in the moment. Thanks for sharing this bit of zen!